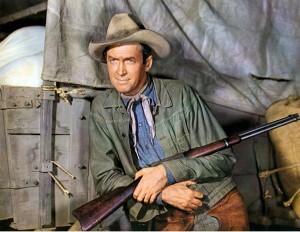 The second and perhaps the weakest of the five Anthony Mann-James Stewart westerns from the early 1950s. 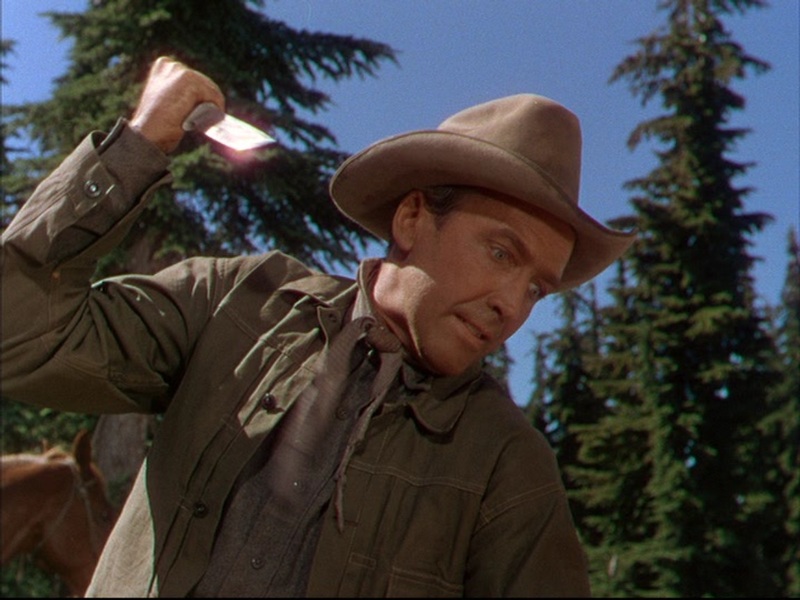 However, even a weak Mann-Stewart western is still highly watchable. Glyn McLyntock (James Stewart) is a former Missouri border raider and gunman leading a wagon train to the Mount Hood area of Oregon (in 1847?) and trying to live down his past. 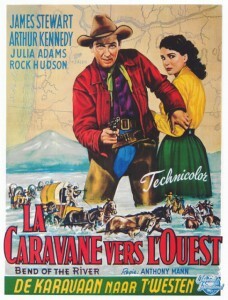 On the way, he rescues horse thief Emerson Cole (Arthur Kennedy) from hanging, only to discover that Cole is a former Kansas border raider and gunman. 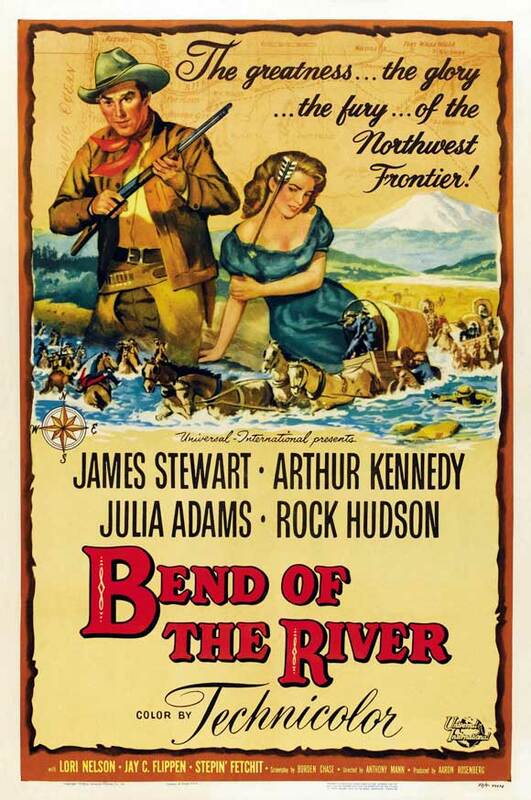 Together they fight off a small band of Shoshone renegades and the train arrives in Portland, where the settlers buy supplies to be delivered to them and head up the river toward Mount Hood. When the supplies don’t arrive on schedule in September, McLyntock and head settler Jeremy Baile (Jay C. Flippen) head for Portland to find out why. They discover Portland is now a mining boom town, and the miners have driven prices for food and supplies through the roof. With the help of Cole and his young gambler friend Trey Wilson (Rock Hudson), McLyntock takes the supplies, closely pursued by saloon owner and slippery merchant Tom Hendricks (Howard Petrie). They eventually fight off Hendricks’ men, killing Hendricks. But Cole has come to realize miners will pay a lot more for the supplies, and he hijacks the entire wagon train, leaving McLyntock behind on foot. McLyntock follows, picking off various of the drivers and taking their weapons. Eventually he succeeds in taking back the wagons, only to have to fight off an attack by miners led by Cole. Jeremy’s daughter Laura (Julia Adams) is the romantic interest, initially attracted to Cole but eventually repulsed by his obvious sleaziness. The plot doesn’t hang together terribly well, and Jeremy Baile is kind of a tiresome character. There’s rather a lot of killing, mostly not of Indians. Set in an earlier period than other Mann westerns (presumably no later than the 1850s, with Oregon immigration and former Missouri-Kansas border raiders), but there are no concessions to that time in the look and weapons. 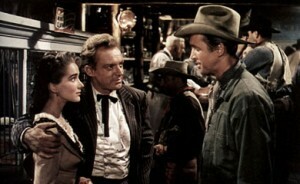 It looks just the same as all other Mann westerns, including The Far Country which is set in 1898. Former bushwacker, now trail scout. Stewart and Kennedy are fine; Hudson seems a little out of place; and the lovely Julia Adams is given little to do. This is supposedly the last film in which Stewart appeared with his real hair. He’s wearing his usual westerns hat and presumably riding his horse Pie, though. Stepin Fetchit plays kind of a jarring character to modern eyes—an old-fashioned black stereotype with near-unintelligible dialogue sometimes. Based on the novel “Bend of the Snake” by Bill Gulick and filmed on location near Mount Hood. In color. The DVD is unfortunately only in full frame, like The Far Country, not in widescreen. Note: Reader Simón Cherpitel notes that Bend of the River was made when many movies and studios were still making the transition to widescreen formats. This one was originally filmed in “academy ratio,” and therefore the DVD shows all there is to see (unlike, say, the later Mann-Stewart The Far Country, which was shot with a more widescreen aspect ratio). 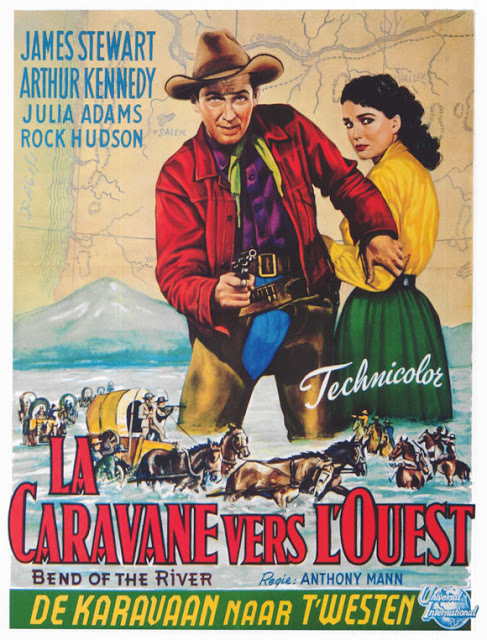 This entry was posted in Westerns Worth Watching and tagged Anthony Mann, James Stewart, Native Americans (Indians), Wagon Trains on November 25, 2013 by Nicholas Chennault.